One of the very greatest Boracay activities is island hopping by sailboat charter. 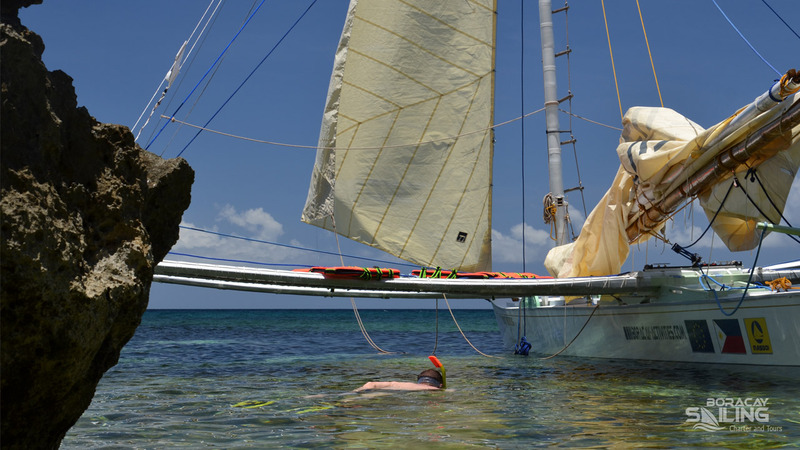 Boracay – sailing & charter activities, there are many. From Boracay Island hopping tours as day trips to long term rental, sailing around the island or sunset sailing. On „Boracay-activities“ we feature for boat rental Boracay, the charter sailboat „Misty Morning“ as the most seaworthy Paraw Sailboat for yacht charter in Boracay, that has offshore qualitys and can sail you anywhere you want in the nearby Boracay Island area. It matches highest safety standards, has outrageous sailing qualitys and offers unbelievable comfort. Inboard engine for emergencys? We have it. Most of all, we offer exclusive Boracay Island hopping tours. Exclusive means, it's just you and the people you're with on board. With all the service it takes to make your Boracay Island hopping day. Exclusive Island hopping and Paraw rental Boracay also means, we keep away from commercial areas, serving mass tourism. (That, if you wish so) We prefer the quiet side of Boracay Island's surrounding, looking forward to show you untouched nature, meet the people and see places as Filippino as an be. We present "Boracay Island hopping", from a completely different point of view. You might enjoy the wild Boracay activities for a while and than feel the desire for some peace of mind? „Boracay Sailing“ is the place for you to go. Kick back, wind down, sail and relax. It is not our goal to compete with other people's prices, but to offer the best you can expect. Our only goal is, to make your day and do what we love to do - which is simply, sailing and be surrounded by happy people. Making your Boracay Island hopping day. We'd like to focus your interest on the great sailboat called "Misty Morning - Spirit of Victoria" In terms of things to do in Boracay, it is one of the most exclusive premium highlights. This sail boat is for charter for a comfortable sailing experience even on an hourly basis. This certainly is one of the most intense - Boracay activities. Boracay Island is part if the goup of islands called Viayas. The province it is part of, is called Aklan. The climate is tropical. Best travel time is between November and end of May. The climate is motly dry in that time. Of course there’s the odd rainshower and due to the climatchange this happens more often now, than in the “good ol’ days”. From around June the rainy season starts. Taifuns cross the islands ant it can get quite uncomfortable. The langauage is called “Tagalog”. Most Filippinos though speak English. Even little children do. So it’s easy to get around most everywhere. Talking about getting around. Boracay has an airport. It is not exactly located on the island, but in Caticlan, which is a 15 minutes boat ride away from the island. International flights up until now land in Kalibo. The bus ride from there to Caticlan takes about two hours. In Boracay itself you can get around by trycicle or even just walk along the beach. The island is small and every place is within reach. The prices of most everything are – compared to the rest of the Philippines, very high. It can happen, that you buy two scoops of icecream in a restaurant for 350,- Pesos and the waitress that serves it with a smile, will only earn 260,- Pesos for working a whole day. Apart from Boracay Island hopping guided tours we offer: Family sailing with children, incentive - teambuilding events, offshore sailing, sunset sailing, sailing around Boracay Island, last minute booking and hourly rental of our sailboat. There is plenty of nightlife like bars, restaurants and discos. Entertainment of all kinds – from music to performing artists as well as some streetperformers you will find most anywhere. Activities offered during the daytime are for example golfing, sailboat charter, scuba diving, tennis, and a great variety of water sports activities. On "Borcay Activities" you find it all. Things to do in Boracay there are plenty. We feature some of them. In case you want to build yur own Paraw sailboat, we gladly recommend Mr. E. Tolinero as one of the greatest craftsmen in Boracay & Caticlan. You can rent a sailboat to go island hopping. The outrigger sailboats you can rent or charter, are called Paraw. It takes at the minimum three people to sail them. The balance has to be kept – so the guys on the outriggers far end, are called “balancers”. Apart from saling to the islands that surround Boracay, which is offered as “Boracay Island hopping tours” you can also rent or charter the sail boats for a calm sunset sailing trip or even on an daily basis. In the morning or late afernoon there are plenty of shopping possibilities. (The middle of the day can get simply too hot.) From a shopping mall to local markets for fresh foods you will find it all.